Home > Events > The Last Oneg of the Season! The Last Oneg of the Season! 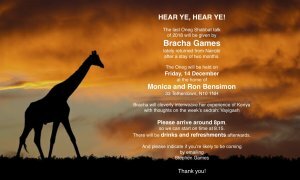 The last Oneg Shabbat talk of 2018 will be given by Bracha Games, lately returned from Nairobi after a stay of two months. Bracha will cleverly interweave her experience of Kenya with thoughts of the week’s Sedra – Vayigash. Our hosts are Monica and Ron Bensimon. Please arrive around 8pm, so we can start on time at 8.15. There will be drinks and refreshments afterwards. Friday, 19 October at the home of Robert and Toni Marcus when Robert spoke about the Sedrah of the week, Lech Lecha.